At NeuRA, we work with patients who have a form of younger-onset dementia called semantic dementia (SD). These patients experience progressive damage to a specific region of the brain called the temporal lobes; as a result, they forget the names and functions of simple objects and lose the ability to recognise familiar faces or popular tunes. Despite these profound difficulties with naming and comprehension, SD patients perform well on tasks where language is not required, such as visual memory and spatial navigation tasks. They also remember events from their recent past with a surprisingly high level of detail. When it comes to imagining the future, however, SD patients have striking difficulties. This ability to mentally travel through time represents a uniquely human activity; we frequently withdraw from the current moment to reflect upon our past or to imagine upcoming events in the future. Research has revealed that we use a widespread brain network to accomplish these complex acts. Our work with patients with semantic dementia has allowed us to tap into this network and pinpoint the key regions in the brain essential for imagining the future. Key regions of the brain implicated in remembering the past, and imagining the future. Taken from Irish, Piguet and Hodges (2012). Nature Reviews Neurology, 8, 152-161. In a recent series of studies, we asked participants to remember past events from the last year and to imagine possible future events within the next year. While patients with SD could remember recent past experiences at a high level, they showed profound impairments when envisaging the future. When we related patients’ task performance to their structural MRI brain scans, we found that these deficits in future thinking associate exclusively with damage to the anterior temporal lobes. This brain region is essential for our ability to store general world knowledge. 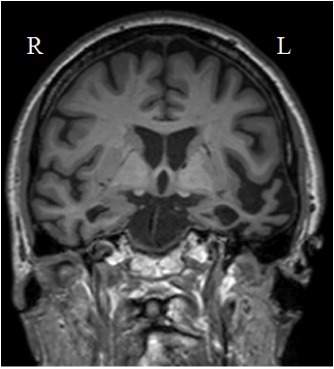 Typical pattern of brain atrophy in semantic dementia. In this image, we can see the classic left-sided atrophy in the anterior temporal lobe and temporal pole, regions crucial for general knowledge of the world around us. Piecing together the evidence, this study suggests that general knowledge is essential for our ability to imagine events in the future. In a second study, we investigated the quality of the future events imagined by our SD patients. We instructed participants to rate their remembered (past) and imagined (future) scenarios for level of detail, emotionality, and personal significance. Not surprisingly, the imagined future events contained fewer details than their memories of past events. Interestingly, however, our SD patients rated these future events to be as detailed, emotionally strong and personally significant as the past events. The inability to imagine the future in semantic dementia arises due to damage to the left anterior temporal lobe. This region of the brain is believed to underpin our knowledge of concepts, and therefore can be thought of as the brain’s general knowledge store. Taken from Irish and Piguet (2013). Frontiers in Behavioural Neuroscience, 7: 27. What we found from this study was that despite a profound inability to imagine future events, the subjective experience of SD patients remains remarkably consistent across past and future contexts. Importantly, these patients tend to ‘recast’ old events into the future rather than create novel experiences. Thus it appears that general world knowledge is essential for our ability to imagine not only the future, but to confer novelty and detail to these events. This series of studies gives us important insights into how we engage in complex feats of thinking. What remains unknown, however, is the impact of future thinking difficulties in patients with dementia on an everyday level. If a patient with dementia cannot imagine the outcome of certain actions, for example, does this mean that they are more likely to engage in risky decisions? Our next step will be to investigate how an inability to imagine the future affects patients, and their caregivers, in everyday life.